Like most meat and fatty food lovers, I regard all vegan, fat-free, gluten-free, low-carb alternatives with skepticism. I scoff, wondering aloud to everyone around me who don't actually care, "Why not eat LESS of whatever you want instead of mashing fistfuls of those damn Twinkies into your face?" And I scoff some more, "Those substitutes taste so awful, I'd rather eat a pile of Brussels sprouts. At least I wouldn't be constipated." So when my friends Isaac and Trent showed me their Surprisingly Vegan gluten-free waffle mix, I wasn't exactly salivating in anticipation. It was when I took a closer look and saw it was made up of few, natural ingredients -- gluten-free oats, walnuts, flaxseed, coconut palm nectar, sea salt and vanilla beans -- that my curiosity was piqued. At least the mix wasn't made up of weird chemicals I have to spell-check like aspertame or weird substitutes I know I hate like stevia extract. I accepted a box and stole my mom's waffle maker. (Sorry, Mom, I'll bring it back. Also, Mom, thanks for remembering how to spell "delish megish" and for typing it into the Google.) I was open-minded about the possibility of being pleasantly surprised but still cautious about the potential yuckiness. First, I was glad to see that the waffle mix was vacuum-sealed, because it's a good guarantee of freshness. As I prepared the waffles and then poured the mix into my (stolen) waffle maker, I was surprised by how accurate the preparation and cook times were. Due to my hotter-than-average oven, my cheap and lightweight pans, and many cookbook authors not testing their own recipes prior to publication (you'd be surprised by how often that's the case), I've learned to figure out my own cook times. Not too shabby, right? An actually healthy waffle. An actually healthy mix where all you have to do is add water. An actually healthy, sweet, yummy breakfast. Oh, who am I kidding? Of course, I slathered some butter and syrup on that little guy and settled on partially healthy. And... It was actually good. It had the same, outer slight crispiness and inner fluffiness that any good waffle has. It was vaguely nutty and vaguely vanilla-y. It was a waffle I would eat again. Which I did. I added a pinch of nutmeg and dash of cinnamon. I topped it with bananas. I spooned on freshly-made whipped cream. I considered dolloping a scoop of ice cream (not necessarily vegan or gluten-free) but I didn't have any in my freezer. I thought about other possibilities: Adding chocolate chips into the batter. Pouring the batter into a Belgian waffle maker. Making crepes. Adding a tablespoon of baking powder to make pancakes. Lots of ideas and not enough time to experiment. Buy it! 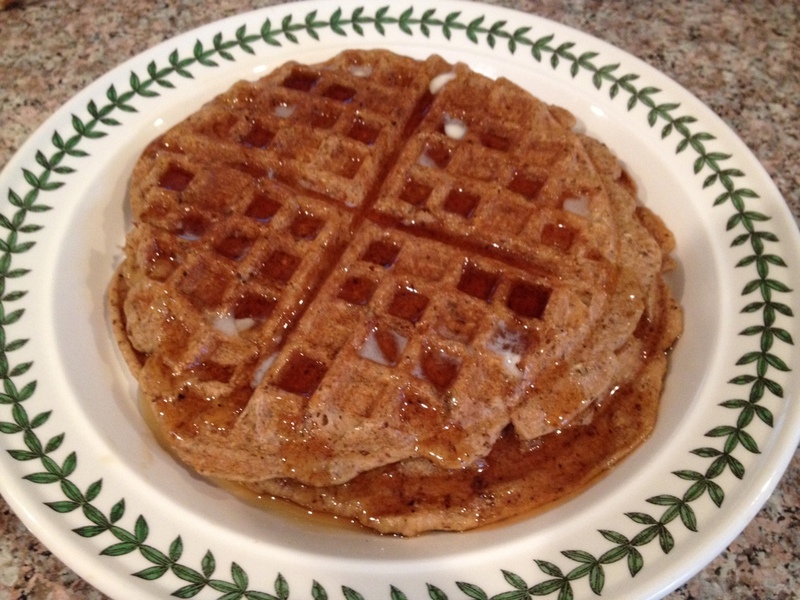 If you have any other ideas, if your tastebuds are dancing or if you're just curious, you can buy the waffle mix on SurprisinglyVegan.com. Two packages cost $16.99, which I think is a decent price for something that actually is healthy (rather than claiming to be) and that's made up of wholesome ingredients.